Game 2 of the Olympics Basketball for Team USA against Tunisia. 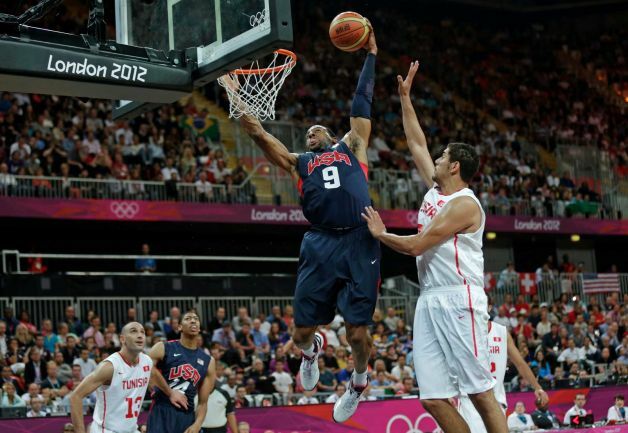 After a slow start and a second half lineup change, USA goes on to victory 110-63. The usual starters for Team USA are Kobe, LeBron, Chandler, Durant, and Paul. They ended to first half up 13 when Coach K decided to start the second half with Melo, Westbrook, Love, Deron Williams, and Iguodala. The team was intense on defense and capitalized on turnovers that lead to easy fast break opportunities. Next up is Nigeria on Thursday. Melo finished with 16 points and Chandler had 6 points along with 6 rebounds. In another game, Argentina lost to France 64-71 where Knicks guard, Pablo Prigioni, scored 7 points and dished 8 assists.